IEH1 Evolution Series Electric Unit Heaters feature stainless steel tubular elements. 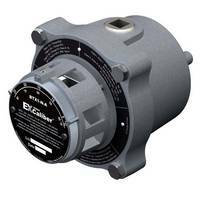 IEH1 Evolution Series Electric Unit Heaters come with sturdy powder coated 16 GA galvanized steel housing and inlet/outlet grilles. Units meet U.S. and Canadian certification standards. Products are available in three housing sizes and 76 model of voltage and heat output combinations choice. 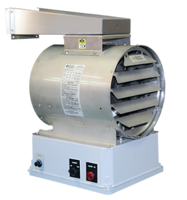 IEH1 offers air flow and air throw up to 50 ft.
Hazloc Heaters™ Introduces IEH1 Evolution Series of Industrial Electric Unit Heaters. 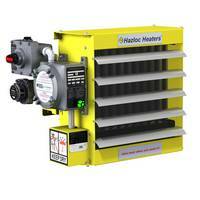 Hazloc HeatersTM, a leading manufacturer of industrial unit heaters for hazardous and severe-duty locations, is pleased to announce the introduction of the IEH1 Evolution series of industrial electric unit heaters. 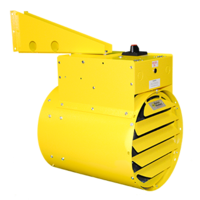 The IEH1 Evolution series of unit heaters are designed for maximum heating performance and to provide primary or supplementary heating of people or equipment in non-hazardous and non-corrosive environments. IEH1 models are designed to meet U.S. and Canadian certification standards. The three housing sizes of IEH1 heaters are available in 76 model choices of voltage and heat output combinations to meet your specific requirements. Numerous factory built-in options are also available for added convenience and safety. The rugged and versatile IEH1 heater incorporates high quality stainless steel tubular elements, high performance fan and motor assembly, and sturdy powder coated 16 GA galvanized steel housing and inlet/outlet grilles. 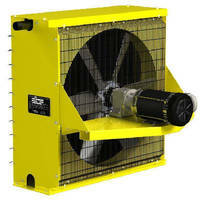 The high air flow and air throw, up to 50 feet (15 m), promote air circulation within the space. Furthermore, the more uniform temperature increases comfort levels and helps eliminate cold spots. Hazloc HeatersTM General Manager, Darren Ochosky, stated, "The IEH1 heater is the seventh series of heaters introduced in our product line. The addition of this heater was a natural evolution in our product offering and reinforces our dedication to helping our customers grow and prosper by providing leading edge industrial heating products, technical expertise, and outstanding service.” Hazloc HeatersTM is also committed to a high standard of quality and on-time delivery performance. Hazloc HeatersTM is based in Calgary, AB. For further information, please contact Darren Ochosky at 1-866-701-Heat (4328) or 403-730-2488 or visit www.HazlocHeaters.com. WCH1 Neptune Series Electric Unit Heaters come with non-metallic control enclosure. XEU1 Series Heaters features corrosion resistant GA steel cabinet. EXCaliber Series Thermostats offer IP66 and Type 4 rating. 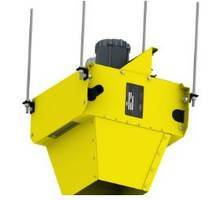 Heat-Exchanger Unit Heaters suit rugged applications.